This is the 4th we created at August Stamp Camp. Being a big fan of palm trees and tropical climes (except here in Indiana), I just love this Bundle and the coordinating DSP. Send me an email or comment for a FREE printable project sheet. Let's get started! This card was so easy to make and I already owned all of the products I used - always a plus. You probably have most of them, too! Let's get started. Labels: Bat Punch, card-making, Hometown Greetings Edgelits, Lovely as a Tree, Stampin' Up! ONLY A FEW DAYS LEFT and STAY TUNED FOR MORE RETIRED PRODUCTS - FREE, FREE, FREE! Just a few days left to take advantage of the above promotions. Remember, with Bos Days, you earn a $5 coupon in August for every $50 you order and you get to spend it/them in September when the HOLIDAY CATALOG goes live! I have $15 in SU! Coupons - how about you!? FREE, FREE, FREE TO GOOD HOME! I am detaching myself from more and more of my retired stamp sets, embossing folders and dies. I have reorganized and I must get these items off the floor of my office/stampin' studio! Go to my blog now for the first list and more details. Labels: Bigz, Bigz L, Bigz XL, Holiday Stocking, Sizzix, Stampin' Up! One of my favorite and most versatile of the Stampin' Up! sets is Lovely as a Tree and I'm apparently not the only one. I've been a Demo for 15+ years and Lovely has been there since before me. We've also fallen in love with the Woodland TIEF, Pinewood Planks, Wood Textures DSP, Rooted in Nature - do you see a pattern here? ;-) This new set (and Bundle), Winter Woods (Holiday, p.27), is a wonderful addition to your collection if you love nature and trees. The soft, skeletal trees alone are enough for me! Just click above for a short, informative video - there is more to this Bundle than meets the eye. If the link above doesn't work, follow this link: https://www.youtube.com/watch?v=OrpOK0BJibE Enjoy. I saw just a section of what I presume is a card very similar to this one, on France Martin's blog in a collage of projects. I could not find the full card anywhere online, so I decided to just wing it. You could certainly use any colors for the "bubbles," but I decided to stick with what I had seen on the blog, partially because they are not colors I would have chosen on my own - if that makes sense. Go to my blog and let's get started. 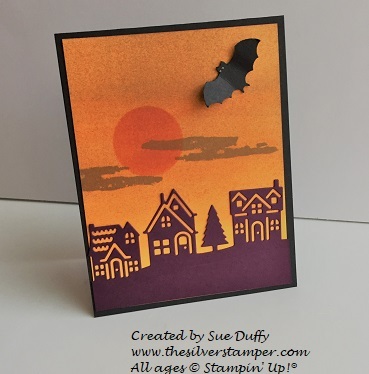 Here's another of the four cards we created at Stamp Camp this month. Don't you love the vibrant colors? Let's get started! As promised in my July 14 post, here are the details for this card, one of the four created at Stamp Camp yesterday. Let's get started. · Squeeze Bermuda Bay Pad to get color onto inside cover (use a drop of refill, if necessary), add quite a bit of water with your Aqua Painter and lightly dribble and dab here and there on background of Shimmery White card front. Do the same with Coastal Cabana and, if desired, a little Blueberry Bushel. Dry with low setting on heat tool. Add card front to base, add Glitter Enamel Dots. Decorate WW for inside as desired.